Chas. S. Hebard replies to an appeal for gifts during desperate times due to a severe "drouth" that has parched area gardens and orchards. Original recipient, Mrs. Chas. 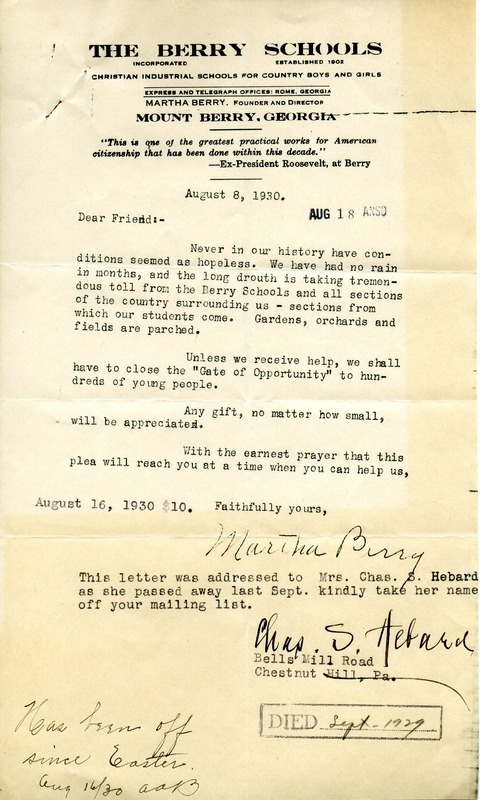 S. Hebard, died in Sept. of 1929 so Mr. Hebard sent a reply and asks that Mrs. Hebard be removed from Berry's mailing list. Martha Berry, “Letter to Martha Berry from Chas. S. Hebard.” Martha Berry Digital Archive. Eds. Schlitz, Stephanie A., Chelsea Risley, Alan Henderson, Kasey Haessler, et al. Mount Berry: Berry College, 2013. accessed April 21, 2019, https://mbda.berry.edu/items/show/12808.